Can the Pursuit of Financial Independence Work for Aspiring Cabinet Ministers in Singapore? Mr Goh said that after Prime Minister Lee Hsien Loong approached Mr Tong to be a senior minister of state, the latter went to see him. They are fellow MPs for Marine Parade GRC. Mr Goh recalled their conversation: “He said, at this stage of his life, he has got a house, he has got a mother-in-law to support, a father-in-law to support, his own parents and so on, what should he do? Mr Goh here, is Our Emeritus Senior Minister Goh Chok Tong, who recounts a good example of why minister should be paid enough. If they are not paid well enough, we the citizens of Singapore will have to bear the consequences of “very, very mediocre” people being ministers in the long run. The example he cited was MP Edwin Tong, who was a partner at leading law firm Allen and Gledhill. He is also the lawyer who represented Kong Hee in the City Harvest Court case, since it was assigned to him. I nearly choked on my dinner when I read this. And the first thought that ran through my head was my fear for my friend Chris from Growing your Tree of Prosperity . Chris, just finish his law degree. He has 2 children to support. His wife doesn’t work. He supports his father and mother. His wife who doesn’t work, has to contribute to her parents as well. What the hell is Chris suppose to do because I am pretty certain he doesn’t earn $500,000 in annual salary (think his earned income is less than 1% of this amount), which Mr Tong is earning right now! In fact Chris decided against a legal career, and living the life of a Hobo (hobo is not a bump but someone willing to work, often work short stints). Being a financial blogger, it is startling to realize that whether you are bright, well off, poor, intellectually challenged, you can struggle to truly understand money and life. When I saw that statement, I genuine think that Mr Tong has a deep dilemma on his hands. His primary concern is to be a good man to support his family in the best way possible. It would be rather irresponsible to take on a lower paying role, for his own fulfillment and neglect his duty as a son, father and husband. This dilemma, is not unique to people in the elite echelon like Mr Tong. I have interacted people who read some of my stuff, appreciate the virtues of pursuing financial independence, pursue this path, so that they can pursue their true calling next time. Which makes me wonder, would concepts like financial independence, work for people pursuing a path to be a minister in Singapore, to serve Singaporeans with a lower pay of at least $500,000/yr? I written a bunch of stuff on this subject but most of them deals with the monetary side of financial independence, why it is a better concept than the traditional retirement. However, talking about the numbers tend to distract people into thinking financial independence is about retiring early. 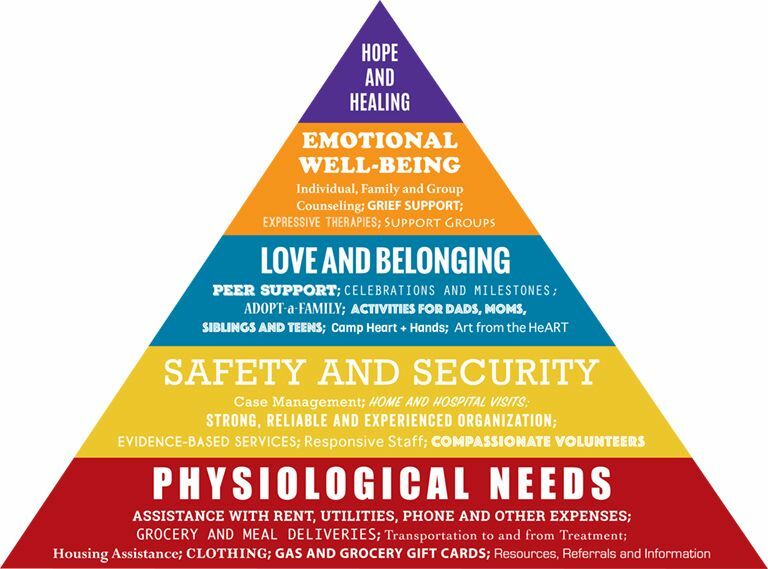 To put it simply, financial independence is often to satisfy the bottom base of the Maslow Hierarchy of Needs. When you settled the physiological needs and safety and security, you can then focus on those stuff that are more psychological that are more fulfilling. The context of the discussion are on the elite people in Singapore. They have this dilemma, because by serving Singapore this way, it is always going to be a monetary step down. So the consideration here is that you make more than $500,000/yr. It is not important how we deem these people as elite. The incumbent political party has a certain criteria of determining what would make good ministers. 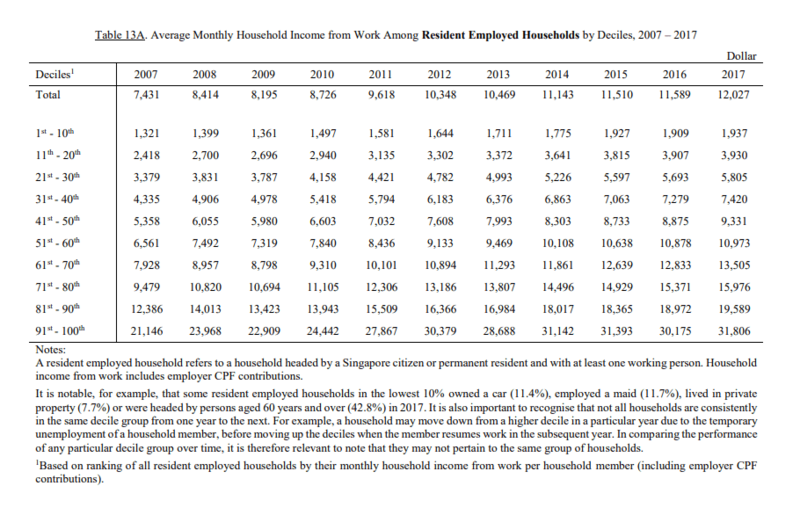 If you earn $2 mil, you are in the top top top top decile of Singapore household income. And these folks should not have an issue mastering wealth. The formula to build wealth is no different for them than for myself. You earn more, optimize your expenses. What is left is your free cash flow, or capital wealth. If you learn to accumulate your free cash flow and invest wisely, you build up your wealth. The difference for these folks is that, the percentage that they can channel into build wealth is going to be extremely large. Most of those that I know who pursue this path have a savings rate of 40-50% of their annual disposable income. Now, one big advantage for a lot of them is that their annual income is in the higher deciles. We are talking about perhaps 51st to 80th decile. When your disposable income is high, when you control your expenses, your savings rate can be high, yet you can maintain a relatively good standard of living. When you earn above $1 mil per year, or on average $83,333/mth, you can save 80% and spend $16,666/mth and maintain a pretty good standard of living. For those that are new to InvestmentMoats.com , the table above shows the number of years a person needs to reach financial independence. It is an estimate based on some common rule of thumb, so don’t hold me accountable for your financial independence. You can see your financial independence depends on your savings rate, and the rate of return on average for building your wealth. 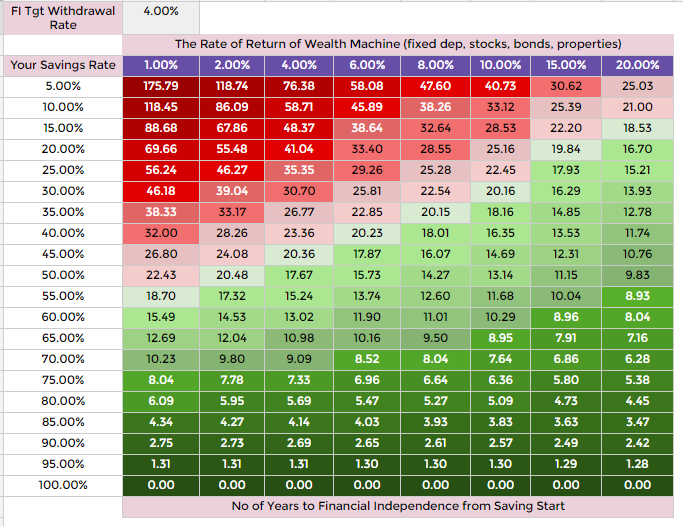 The unique thing is, if your savings rate is raised, the impact of the rate of return matters much less. And savings rate is the easier thing to configure, versus your ability to ramp up the rate of return. At 80% savings rate, to reach financial independence, the person would take 4.45 years to 6 years, depending on her rate of return. That is not much of difference, certainly shorter than the 10 years to 22.5 years if her savings rate is 50%. If the income is much higher, the time to independence might even be as short as 1 to 2 years. If you have a goal to serve the public, with this kind of salary, could you obtain financial security by working 6 years and living a discipline life? If he is insecure about his situation, you can see him working 4 to 6 more years for a total of 10 to 12 years, to build up double the amount you need, and you still have a lot of time to serve the public. To solve your monetary insecurity, you still have a $500,000/yr salary to fall back on, should your wealth is not enough, like Mr Tong. So if we settled the monetary side of things, then the next aspect of financial independence is to figuring out your priorities in life, so that you live a good life. This is probably the more important aspects of financial independence that is lost in translation. Financial independence importantly, is looking at the whole portfolio of what you have experienced up to this point, the portfolio of what you could experience but have not, and find out which one matters more, and discard those that matters less. You find out what you want in life, then build a wealth machine to buy it. However, the reality is not so simple. You will likely feel a clash in different identities. Up to this point, you might have been a great lawyer and you might not be so ready to relinquish that identity. Would the trade-off to be a politician be worth it? Those who understand intently what they want, and build their financials around it are powerful people. They don’t earn above $1 mil. They have the same life challenges of a family, extended family but also some priorities that put their finances to the test. I have a reader in the past who wishes to have one spouse stay at home. This is a priority that many wives yearn for. 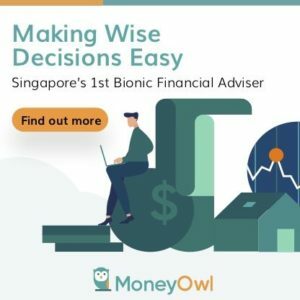 His spouse and himself felt that this is a high enough priority for them to build their finances to facilitate that, yet still have a sound plan to coast towards retirement. Recently, I profile a reader who wishes to get a second validation of his plan to quit a well paid job, for something that would pay less but more meaningful. From my computation, he can achieve coasting financial independence. It turned out that the more I learn about my reader’s work, the more I realize his path is rather set if he continues with that overseas stint. Leaving this lucrative career to do what he deems as meaningful would be a big pay cut. And you have to wonder eventually if its more meaningful. These are folks in the 51st to 80th decile, taking control of their financial lives. Somewhere a long the way, they identified with a philosophy that is stronger, and decide to use their wealth to purchase security and pursue that philosophy. If ministers are not paid well, “very, very mediocre” people will be ministers in the long run, he said, adding: “Think about that. Is it good for you, or is it worse for us in the end? Later, he back tracks a little. In times of peace and prosperity, their ideal candidates are motivated by personal aspirations, freedom, privacy and life style. I disagree with his first statement. His second statement maps accurately to what I have described about the philosophy behind financial independence. It has less to do with money. It has more to do with the crop of folks who they think are ideal candidates. These potential candidates prioritize their career away from their willingness to take a pay cut to serve the citizens. These potential candidates have greater ambition that is not political. There are ministers who left for the private sector. They could be motivated by money. But could they at the same time be motivated by ambition for a new interesting portfolio? Can Kyith’s thesis that the ideal candidate’s motivation is more than about money be wrong? But you have to wonder if that is the case, would the citizens of Singapore accept that the best people to rule and make the decisions for this country is primarily motivated by money. She returned to become Indonesia’s finance minister, taking a massive pay cut in the process. At some point, your motivations would have to de-link from money officially. For some, it is time to stop unfulfilled life, unjust life from eating away you from the inside and starting doing more things to heal the soul. In my observation, if you are capable, opportunities will come along your way despite you wanting to do the good work for less pay. In Mr Tong’s example, he does not lack selflessness. However, being selfless does not mean that you won’t have doubts about how secure financially you are. And this is the same challenge that a lot who are less elites will face: A profound understanding of your own financial security or the lack of financial security. The financial planning community here plans for you within a fixed pathway to living life. The industry is very well regulated with a lot of compliance involve. I will contend that you will get more people that are financially secure to come out that are more selfless, committed and highly motivated to serve in different capacity of society. One of the companies that Providend spun up due to their observation of their wealth management clients is Logos Learning. Christopher Tan, the CEO rope a few financial bloggers together to challenge our existence at that point of our young lives. I must say that it gave me pause to put into context what we have been doing with our lives up to that point. It is certainly useful for early 30 something folks but I think for those that are in late thirties and forties, this would benefit them immensely because that is the period where we grapple with our family, work and our existence in this society. Logos Learning’s Finishing Well to me targets those that have done well in life, or those who are conscientious to live a good existence. Somewhat, it fits the group of people the incumbent party is targeting. Their wealth may have created security for them and open up options. Make them question their own existence! Strip away his identity as a high earning lawyer, and Mr Tong’s dilemma is the same as that faced by some of us. I do contend that some of us have it tougher because the financial situation we have to work with is more constrain. Mr Tong’s family situation could be different, in that it requires a lot of monetary support. However, I shudder to think that if $500,000 to $2 million cannot solved the problem, what are the chances that we, with $120,000/yr to $240,000/yr in household income can solve the problem? Ultimately, it is a question of character and individual choices. Money is merely a tool, which if used wisely, can be a lush oasis that is capable of facilitating one’s pursuit of happiness, but if used or chased in an ill-consider manner, can turn into a toxic mirage. The philosophy of the pursuit of financial independence draws a lot on solving our greatest money insecurities. Whether you are well off or not, you may be plague by these insecurities, and that is why this competency will always be applicable to allow you to create a life where you can eventually pursue goals that are not rewarding as becoming a minister in Singapore. If you do not have money insecurities, you have to have someone validate whether you are financially secure, because you could very well not have insecurities because you are very dependent on others. You lack the awareness about your lack of financial securities. In the worse case, you even live a life you thought its fulfilling and rewarding but turns out to be fake. I hope my post can encourage more selfless, committed, motivated and competent individuals to become our future ministers. Thanks for that post. Good start to Sunday morning. I did not realise that Singapore has by far the most expensive administration on the planet, if we exclude the various royal familes. Poor Donald must be struggling to make ends meet with his meager USD 400k. And he is filling two jobs, Head of State and Head of Government. Those two roles together attract a tidy USD 2.8m in Singapore. Hmm … as politicians, MPs or ministers; they are under watchful eyes of the public and media. Not sure how many FI seekers want to disrupt their “freedom” or “carefree” lifestyle. Haha, well if Trump is to be believed, he’s taking US$1 annual salary & donating the rest of US$399,999 to charity. SMS basic monthly salary is $46,750. The $935K figure is based on “typical” 8 months bonus, which based on wordings in Straits Times & the ministerial salary review report, is quite the norm. Note that only 3 out of 8 months is actually based on “performance” — the other 5 months is either standard or based on global economy. 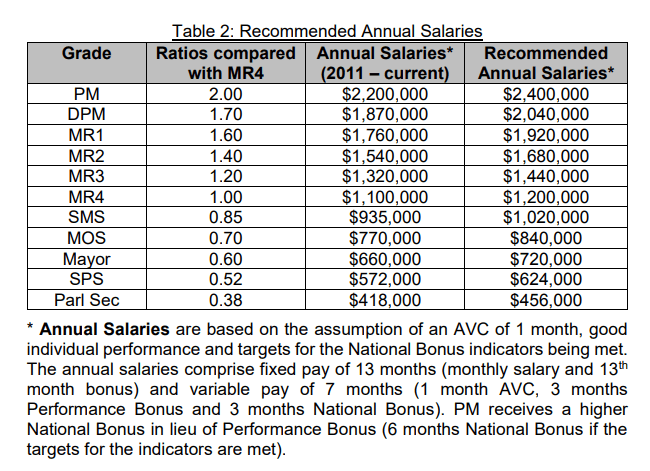 Max bonus for Singapore’s political appointees is 14.5 months, of which 6 is based on “performance”. This is particularly when the global economy, manufacturing etc is doing well. So realistically Tong is looking at a salary between $935K to about $1.24M, unless he really messes up or Singapore goes into a 3-year recession. Don’t forget that he still has another $192,500 as MP allowance. And regarding his $2M lawyer earnings, it’s very likely a once off for a very good year. A partner’s total salary is variable and depends on firm’s performance, individual performance, the number & type of cases, the type of clients etc. Any lawyer can tell you it takes a hell lot of time, effort, resources to get business for the firm & to be assigned the big lucrative cases. Will he need to put in as much hours as SMS? I seriously doubt it. So given that, which is a better quality of life? perhaps he is not looking for a better quality of life but to match the right ambition at that stage of his life. In terms of work-life balance, SMS will trump that of law partner. And if I want to aim for the big bucks … there’s still the route to full ministership up the MR4 to MR1 salary grades. Note that SMS salary grade is already almost there with the lowest MR4 minister salary grade. And can always maintain strong network with legal industry, keep abreast of legal changes etc to maintain legal competency. As i said, if you are good, maintain good relationships, there will be a lot of money left on the table. a lot of opportunities that fit your aspirations and life goals as well.